High dose of vitamin C in a single dose! 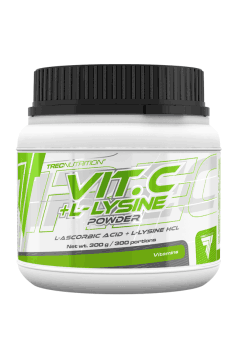 The supplement Vit C + L-Lysine Powder is the preparation containing vitamin C, additionally enriched in lysine. Both these substances have positive influence on immunity of the organism and the synthesis of connective tissue. It constitutes important protection from injuries and negative effects of the organism aging. Vitamin C is one of the best-known pro-health substances. It is soluble in water, which makes it incredibly impossible to overdose. It is mainly known for its antioxidant effect, thanks to which it supports the organism in the fight with free radicals. They are molecules, which have only one unpaired electron. It constitutes a factor inducing mutation and damage of nucleic acids and proteins, which leads to the development of many diseases. Free radicals are produced during natural metabolic transformations and in coexistence of harmful factors. The application of vitamin C facilitates the fight of the organism with them, thanks to which, it protects almost every cell of the organism from damage. This substance is not synthesized by the human organism. It results from the fact that as one of very few mammals, we have a mutated gene responsible for the synthesis of vitamin C. Its proper supply facilitates collagen synthesis, which is an incredibly important connective tissue in the organism. It ensures proper skin elasticity and builds ligaments and cartilages. Oxidative stress and age are the factors, which impair collagen synthesis. The application of this compound ensures young appearance of skin and strong joints. Cells of the immune system are incredibly sensitive to the influence of free radicals. Thanks to the antioxidant effect, we may notice considerable improvement of immunity, thanks to which, the duration and frequency of infections are decreased. Vitamin C also supports the fight with inflammations, which may be induced by free radicals. It ensures effective protection from developing chronic diseases. Vitamin C has the ability to permeate to the nervous system. It protects the nervous system from prooxidative factors and excitotoxicity caused by excessive stimulation by glutamate. Thanks to this, vitamin C facilitates the synthesis of neurotransmitters, i.e. noradrenaline and acetylcholine. It results from the fact that it facilitates the conversion of dopamine to catecholamines by means of β-hydroxylase and by inhibiting the activity of acetylcholine transferase. It results in improving cognitive functions in people, who have high level of reactive oxygen species in the nervous system. Lysine is an exogenous amino acid, which means that the human organism does not have the ability to synthesize it. Therefore, its proper supply in a diet and supplementation is incredibly important. This amino acid is used as a building element of proteins. Apart from this, it supports the organism in the fight with the virus Herpex simplex. It is responsible for developing inflammatory skin lesions, conjunctivitis and herpesviral encephalitis. Positive influence of lysine on the therapy of this virus results from the fact that it blocks the access of arginine to pathogens. This amino acid constitutes a factor, which is essential for the virus replication, therefore cutting its supplies effectively leads to its death. Lysine escalates antioxidant influence of vitamin C. It results from the fact that this amino acid causes dying of cells, which have some irregularities in the structure of nucleic acids. It is a factor, which protects from cancer development. Moreover, both these substances cooperate in the synthesis of collagen. It was proven that lysine facilitates calcium absorption. It constitutes an incredibly important factor for the health of bones and teeth. It was also observed that lysine is a factor that limits the process of glycation. It consists in binding glucose cells to proteins and lipids, which inhibits their functions. Such a state is characteristic to diabetes. The supplement Vit C + L-Lysine Powder is a preparation which is composed of beneficial vitamin C and amino acid lysine. Both these substances support proper functioning of the organism and facilitate the work of the immune system. Moreover, they mutually escalate positive influence on collagen production, which constitutes an important factor maintaining food state of skin and joints. The supplement is addressed to people, who care about maintaining proper health and good state of connective tissue. Take one scoop (approx 1 g) and mix in water or juice. Drink during or immediately after meal. A single dose of the supplement contains a high dose of vitamin C. It may induce ailments in the digestive system in sensitive people. In such a situation, it is recommended to divide the recommended dose into several smaller portions, which should be taken a few times a day. Thanks to the fact that both ingredients of the preparation are safe and do not demonstrate toxic effect, it is possible to increase a daily dose, which should maximize the effects. During supplementation it is worth using preparations with iron, zinc and copper as the active ingredients facilitate their absorption and boost their effect. Vitamin E additive may positively influence insulin sensitivity. Pre-workout supplement. Provides incredible mental and physical stimulation and a strong pumped feeling.